Want to add a new fence to your garden? Need a fence repair specialist to secure your commercial premises? From a 24hr response for emergency fence repairs to stylish, practical garden fencing, Hol-Tech Fencing offers great service and fantastic results at affordable low prices. We can also make gates on site to fit any opening and erect and hand make sheds from scratch. Get in touch today for more information and a free quote. As an experienced landscaper and fencing contractor, I will ensure that you get the result you want. Whether I'm adding a new fence to your garden or I'm providing emergency fence repairs, you'll get a cost-effective result and a full guarantee. Alongside your new fencing, I offer a comprehensive landscaping services for homes and small businesses in Ipswich and surrounding areas. With over 20 years as a construction contractor, I use these skills to provide property maintenance, including roofing and general handyman services. First Class from quote to finished product! James offers a "First Class" service from quote through to finished product. Excellent customer service, great price and fabulous finish. Would thoroughly recommend you give James a call! Contacted James to fix my fence which was damaged from strong winds. His communication with me was fantastic, he did not keep me waiting and repaired the fence in fantastic time (Which was a good 25m+ in length) his attention to detail and the work completed was unbelievably good!! I would definitely recommend James to anyone!! I was suggested to contact James @ Hol-Tech Fencing by a family relative after I was unimpressed with Goddard Fencing on previous work I had done. James was very polite, informative and knowledgeable. Managed to fit me in within time restrictions I had and got the job done on schedule to a very high standard at a reasonable price. I was extremely happy with the service and workmanship carried out. The fence and gate looks fantastic with many neighbours recognising and commenting on the finished work. 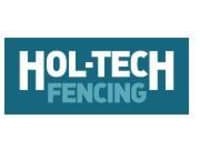 The service provided was professional and I would certainly recommend Hol-tech Fencing to others and will be using him for future work.